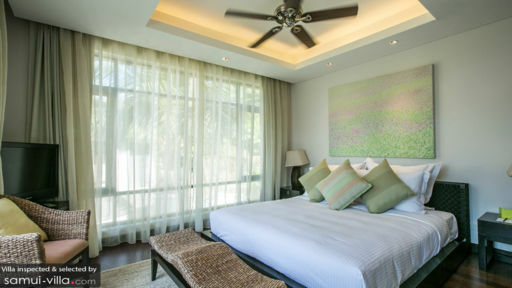 With two bedrooms, living spaces kitted out in contemporary furnishings, Gardenia Pool Villa is ideally set up for couples and small families. 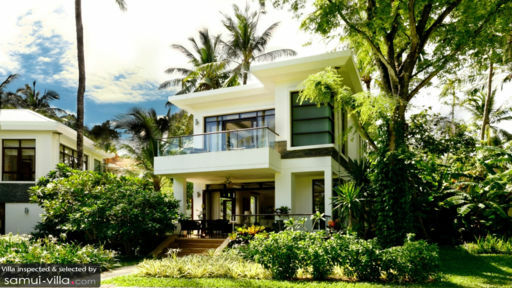 Located along the serene northern coasts of Samui, the villa boasts a tranquil environment that encourages rest and relaxation. Set within easy reach to local amenities and attractions, you’ll be just a quick drive away from convenience stores, restaurants and shops. Each of the two bedrooms at Gardenia offers air conditioned comfort, plush double beds, generous wardrobe space, quality linen and private en suites. The master bedroom stands out with additional features like a flat screen TV, accent chair and spacious balcony with loungers. With a beautifully maintained garden and pool, soak up the tropical vibes outdoors at Gardenia Pool Villa is a treat. A terrace, equipped with a dining set and cooled by ceiling fans extends out beyond the indoor lounge. It’s ideal for al fresco meals and enjoying sundowners. Cosy and contemporary, the living areas feature tiled flooring for both ground floor and rooms, cream-hued walls and modern furnishings crafted out of natural materials. The interior feels bright and airy, thanks to design elements like high ceilings and expansive glass doors and windows. Ornaments like decorative plants and throw cushions add bright pops of colour within. Sink into the sofa or armchairs in the lounge to enjoy a relaxing evening; there’s a flat screen TV, DVD and satellite channels for entertainment. Living room TV is a smart TV with international channels and internet connectivity. A fully equipped kitchen with breakfast bar sits to the back of the common area. Washing machine is available at the villa. Complimentary airport transfers, daily housekeeping, as well as assistance with guest needs and booking of tours and travel activities are offered at Gardenia. A baby cot is available at request. Services available at additional cost include: in-villa dining, private chef services, in-villa massage, babysitting and car rental with driver. Gardenia Villa enjoys a serene ambience. But while your immediate surroundings feel remote, you’re located just a skip away from an array of local amenities and attractions. A convenience store and restaurants are three minutes’ drive away, while supermarkets like Big C, Makro and Tesco are about 20 minutes’ drive from your villa. Fisherman’s Village, located a 15-minute ride away is home to a variety of upscale restaurants, bars and boutique shops. It boasts a family-friendly setting, and is popular among vacationers and expatriates. A longer drive - about 25 minutes - will lead to Chaweng. The town and beach bustles with a lively energy and offers a vibrant nightlife scene. 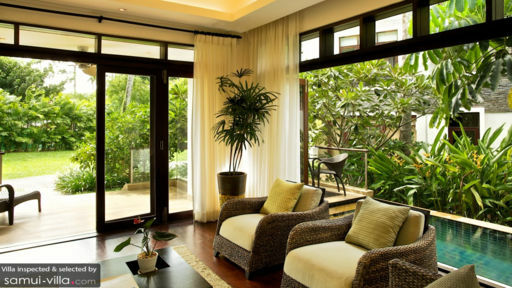 Amenities for kitesurfing, golf, spa and yoga are easily accessible from your villa. A kitesurfing centre in Mae Nam Town (13 minutes’ drive) offers equipment rental and kitesurfing lessons. Santiburi Golf Club (10 minutes’ drive) features an 18-hole golf course, The Yogarden Samui (18 minutes’ drive) offers group yoga classes and Belmond Napasai (seven minutes’ drive) offers incredible spa treatments.